As a New Zealand farmer, you can choose three EffluTrack products, depending if you only want spreader monitoring, failsafe auto shutdown or K-Line Timer & Remote control. EffluTrack effluent monitor works on all travelling irrigators, whether you use a PTO or electric pump. It sends you a text alert whenever something goes wrong with your effluent spreader. The travelling irrigation monitor is a simple, robust device that’s easy to attach to your irrigator. This is your one-stop access for both spreader monitoring and the pump, as well as failsafe auto shutdown and electric pump remote control. Peace of mind – helps you meet environmental regulations. Auto shutdown– automatically turns off pump. Simple & robust – designed on a dairy farm. No monthly fee – one-off hardware investment only. Long-lasting – battery lasts two years at 6 hours a day, 260 days a year. No maintenance – no solar panel to clean, no batteries to charge. Imagine the time and stress this will save you – order your EffluTrack Travelling Irrigator Monitoring System now! EffluTrack effluent monitor works on all travelling irrigators, Irrigator unit is perfect solution for PTO or petrol pump. It sends you a text alert whenever your effluent spreader starts and stops. DIY installation – takes two ticks. It’s a durable device your electrician can attach to your electric pump. Remote control – turn the pump on or off with a simple text message. 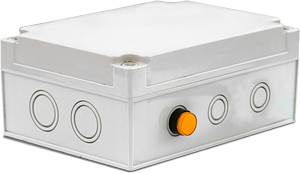 Pump Timer – suitable for most electrical pumps. Easy to install – it will take your electrician a few minutes only. Works with EffluTrack Irrigator Monitor – save cost – use only one EffluTrack Pump Unit to control both Travelling Irrigator and K-lines. * Vodafone plan available at only $10/month per unit. ** EffluTrack Remote Control only works with electric pumps, not PTO. *** EffluTrack Electric Pump Control requires electrician.